Can live betting change the US stadium experience? After last year's groundbreaking decision to strike down ban on sports gambling, legal changes continue across the US. They join ongoing transition from large stadiums to experience-oriented ones. Following the Supreme Court decision from last May to effectively enable sports betting nationwide, changes are already taking shape. While the ruling requires states to create their individual legislation before specific, no-one's wasting time to introduce legalized gambling. As of March, 8 states already have legalized sports betting, two more should have it soon, while legislation is being debated in over 30 states in total. Even if not instantly, the issue has to be taken up by major sports leagues. It coincides with changes ongoing for a number of years, which are seeing stadiums become smaller yet bigger. In other words, capacities continue to decrease, while the footprints for new or revamped venues increase. It's no longer “sit, watch and grab a hot dog”, now fans have wide variety of activities to choose from, keeping them inside the stadium before and after games. 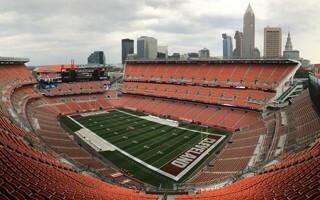 NFL franchises are perhaps the most known for exotic ideas to lure people in for a new experience, be it through swimming pools in Jacksonville, rooftop restaurant in Santa Clara or a car showroom in Cleveland. More common means include pubs or party decks overlooking the field. While traditional betting booths might not arrive soon, online gambling is already here, with domestic giant 888Sport competing to offer best spread betting, money line betting, totals and prop bets. Despite new ways of attracting people, both NFL and MLB have become premium products, pricing out so many people that regular attendances are dwindling in specific cases, to name just the Washington Redskins or Tampa Bay Rays. Along guidelines, preferred capacity for NFL stadiums is now around 65,000, which means a massive decrease compared to 1990s. But with parking alone costing some $40-50 (like at MetLife Stadium) and personal seat licenses forcing some to sell cars or get in serious debt, you can see why the demand is no longer there. Football and baseball have become sports for the more affluent, thus the premium options popping up, providing great opportunities for live betting, depending on state legislature. Major League Soccer is in a different spot, growing rapidly in terms of number of teams and crowd sizes. Still, the league continues to opt for compact stadiums. Affordability is also important for the quite different soccer attendances, who come for a more vibrant, spontaneous and loud atmosphere. Yet even MLS is pursuing a solution towards introduction of live betting league-wide.